Maida Hundeling (center) and the cast of the Utah Opera during rehearsal for Turandot. Love, passion and death are guarantees in opera and Turandot is no exception. It’s the tale of a cold-hearted princess who requires suitors to answer a series of riddles in order to win her hand in marriage–but a wrong answer results in death. The opera is extravagant on several levels, with a massive cast, an elaborate set and haltingly beautiful music to accompany the dramatic story. Utah Opera is performing Turandot all week after a successful opening night on Saturday that ended in a standing ovation from the crowd. 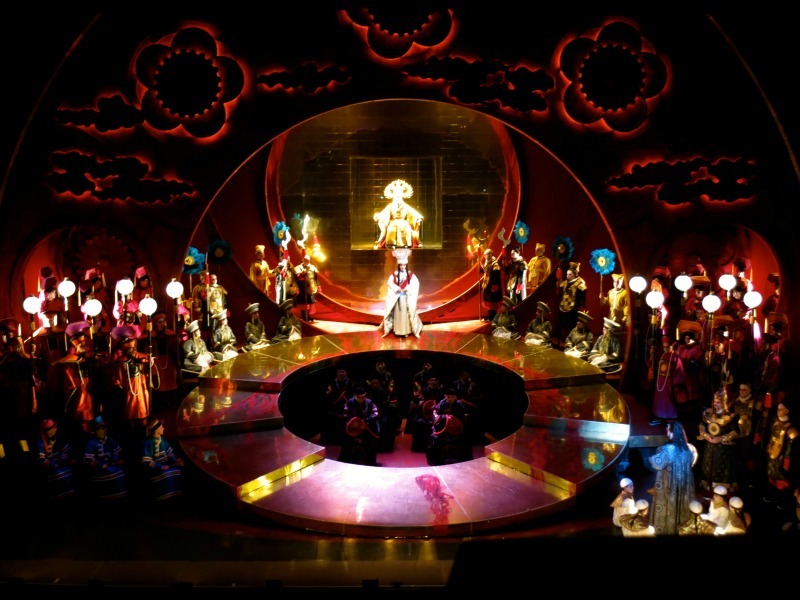 Turandot takes place in fairytale ancient China, its costumes simultaneously futuristic and archaic. Princess Turandot is admired by men near and far. Those that want to marry her must first answer three riddles but if they fail, they are beheaded. While at the beheading of Turandot’s most recent victim, Prince Calaf of Tartary falls in love with her at first sight and, despite everyone’s attempts to dissuade him, takes the challenge to win her hand in marriage. The opening scene of Utah Opera’s Turandot during rehearsal. 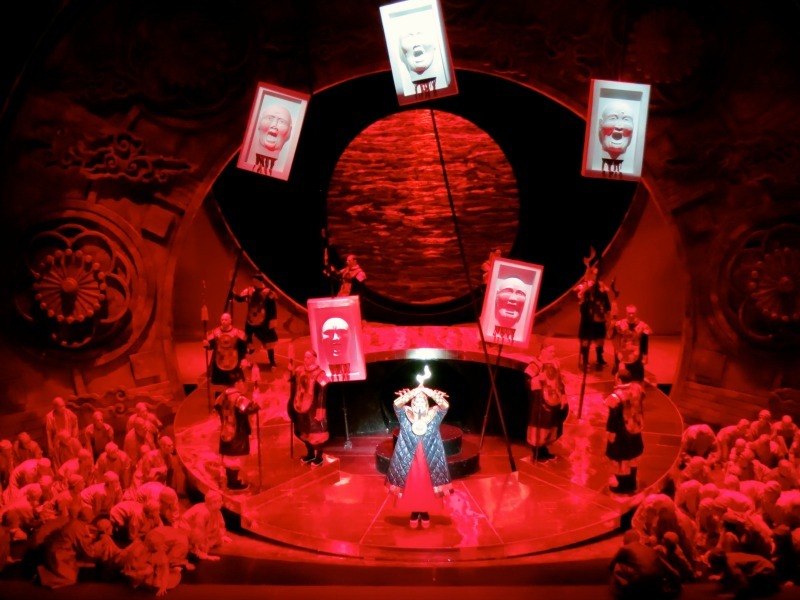 Turandot is notoriously difficult to pull off, as its requirements run high. In addition to the nine principal singers, there are 58 chorus members, 18 children choristers off stage and 10 on stage, plus an additional 12 non-singing men and six dancers. The result is a production as visually stimulating as it is beautiful to listen to. Tenor Jonathan Burton’s performance of Calaf was impressive, especially during the famous aria Nessun Dorma. Soprano Kelly Kaduce was beautifully striking as Liu, both in her voice and her acting, making me wish she had more stage time. But soprano Maida Hundeling’s portrayal of Turandot was outright stunning. The power of her voice was amazingly captivating, like nothing I’ve ever heard with Utah Opera before. It resonated with such passion that it nearly brought tears to my eyes. Turandot is the Utah Opera debut for all three singers and I hope we’ll be seeing more of them in the future. Julius Ahn, Daniel Belcher and Joseph Gaines performed wonderfully as Pang, Ping and Pong (Turandot’s ministers), creating comedic relief without compromising any talent as singers. This is also the first time with the Utah Opera for Ahn and Gaines, while Belcher was recently here in Salt Lake City for last year’s production of The Magic Flute. Joseph Gaines, Julius Ahn and Daniel Belcher during rehearsal for Utah Opera’s Turandot. 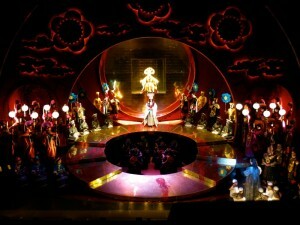 I was blown away by the entire production of Turandot. Utah Opera is proving yet again that they are getting better with each year. Turandot is at Capitol Theater this Monday, Wednesday and Friday at 7:30 p.m. and on Sunday at 2 p.m. Tickets are available online here or by calling 801-355-2787. If you are under 30 years old discount tickets are available for around $20 (mention your age when ordering and be prepared to show your ID at will call). 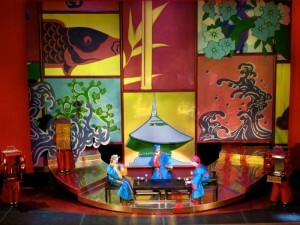 Read more about Utah Opera’s Silk & Spices Festival celebrating Chinese cuisine on two special nights too. I loved Liu, the Executioner, and especially the Prince of Persia. Tell me what you think of their performances!